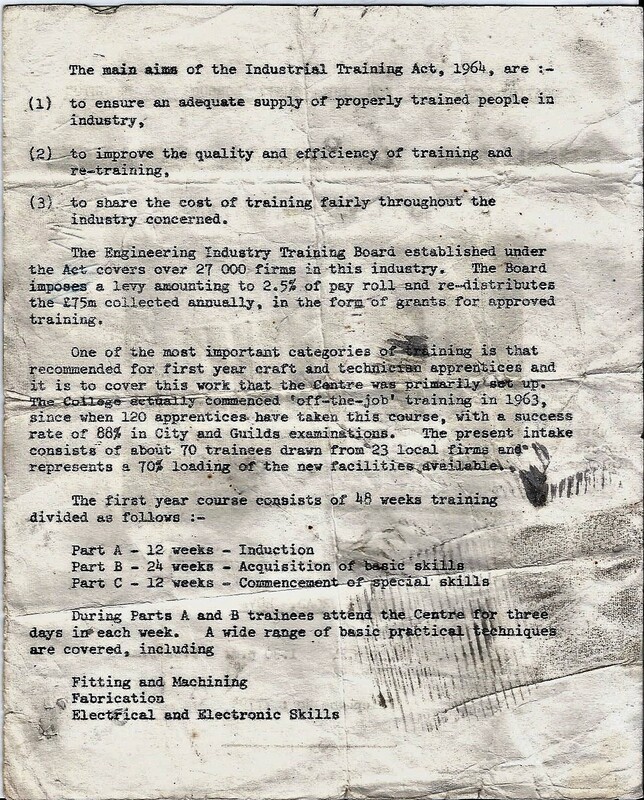 The leaflet, if memory serves, was produced for the opening of School Road in September 1967, it describes the training programme and qualification objectives. There is a list of the College Staff that should jog some memories for ex-students and staff? There is an impressive list of sponsoring companies that show what local (not to mention British) engineering has lost! 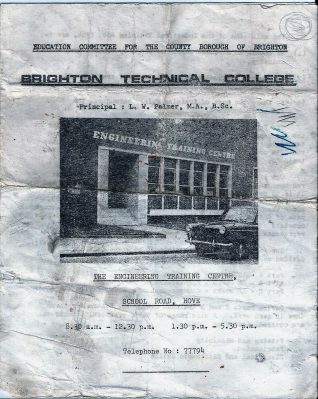 My introduction to engineering was through the scheme described in the leaflet. I was employed as an apprentice by Kearney & Trecker – CVA. I was part of the first intake of about 120 students to School Road in September 1967. The workshops were set up in an empty factory. One of our first jobs was to level all the machines, using a pinch bar, a precision spirit level and packing shims. We had to do all sorts of odd jobs helping to set up the workshops before we got down to training. I remember Peter Barr, Frank Woodhouse, Ralph Budden and Mr Darling, the head of School Road was Alan Dawson. The chap in charge of the Electrical Section was a Mr Taylor, one of our training projects with him was wiring Uni-Selectors for the Telephone Exchange. The chap in charge of the stores was a Mr Piper and his assistant was Mr Peach, he cleaned and lubricated the machines, we made their lives hell! A hundred and twenty testosterone fuelled youths must have taken some supervising but we had a whale of a time and got an excellent basic training in engineering. I used several of the tools I made until retirement. i.e. Vee block and toolmakers clamps. 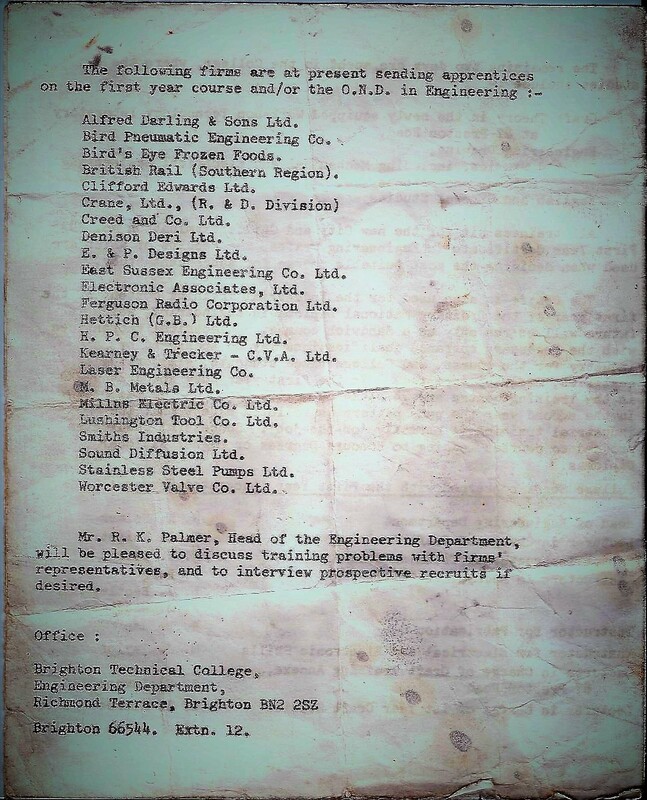 We had three days a week at School Road on practical training and two days a week at Preston Road on mechanical and electrical theory, maths, technical drawing, general studies and science. The science lecturer was called Reg Hough…an unforgettable character. We were caught in the sudden huge snowstorm of December 1967, we all went out at lunchtime doing what lads do in the snow, on our return the building was closed and we were sent home, by this time the town was gridlocked, I had a very cold and wet six mile walk home! The Kearney & Trecker Training Officer, Mr Paine, used to come along to School Road with our wages. At the end of the year we were awarded a certificate from the Engineering Industry Training Board. My apprenticeship with Kearney & Trecker finished in May 1971 – I was immediately made redundant along with hundreds of other employees of KTM due to the slump in British engineering. 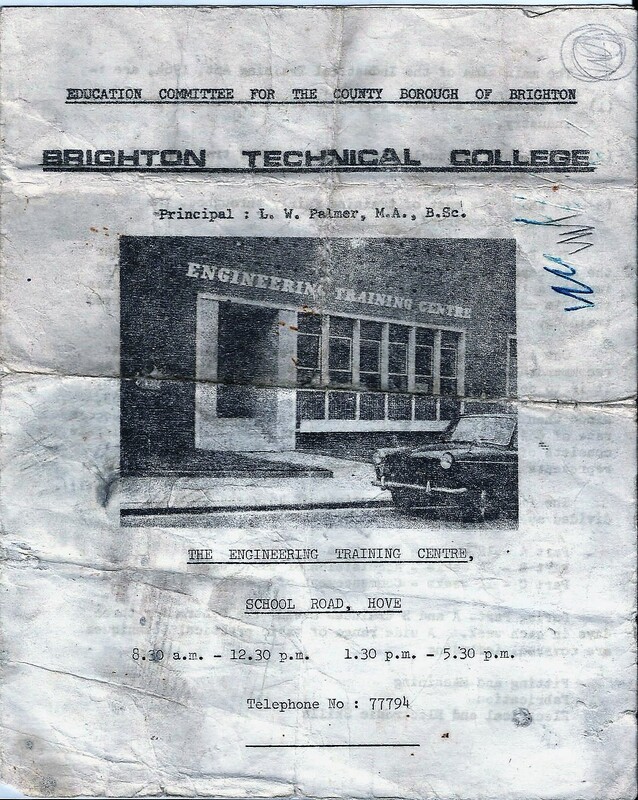 I experienced life on the other side in 1975 as I was employed as a technician at Brighton Technical College in the Engineering Department. I started work directed by Brian Clough Head of Department at 87 Preston Road, my first day coincided with the induction day for first year students in September a ‘baptism of fire’! For a brief period I was seconded to School Road assisting the very able Senior Technician called George. On occasion I had lunch at a local pub and was surprised to meet up with some students, they asked me not to ‘grass’ them up! Hi John thanks for your article, I also was a Kearney & Trecker apprentice and attended School Road in 1970, you can see my article here: http://www.mybrightonandhove.org.uk/page_id__10536.aspx&#160; are you also a golfer? Hi John, superb page & stirred a few memories, rennet doing a stint in each CVA factory, Coombe rd, Eaton rd ( the best) Portland rd & of course Crowhurst rd, like yourself as soon as ending apprenticeship, became redundant !! , though the charge hands son Joe Miller was the only one who stayed lol. Hi Peter, Our time as apprentices did not quite overlap. 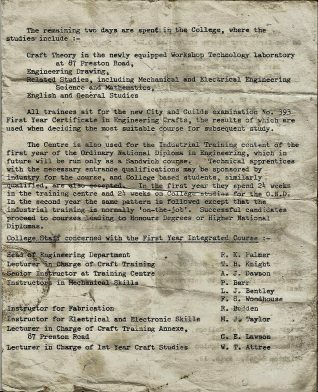 The first year full time training was a terrific grounding for engineers, it crammed in the equivalent college training of 5 years day release! 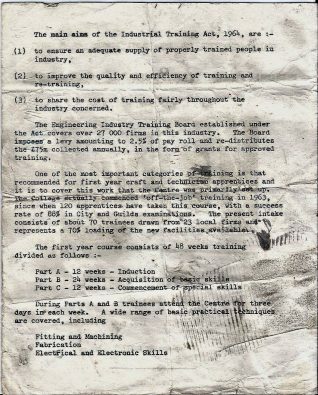 The industrial training on the job subsequently was also very comprehensive, little did we know how lucky we were at the time. It was your article that stirred a very vague recollection of the leaflet that I dug out. I guess you have seen my articles on Hollingbury Golf course, I played golf there for over 30 years unfortunately I am unable to play now. Hi John yes I saw your pages about Hollingbury Golf Course, it was very interesting to hear it’s long history, many thanks. I didn’t start playing golf until quite late in life, wish like you I had started earlier. Atb Peter. I was at School Road 1971-72, the first year was a grounding for me. As a 15 year old I was selected for a one year scholarship by the E.I.T.B with the hope a company would come in and employ me for the rest of my 4 year apprenticeship. I had left school with no qualifications at 15 from a school with no metalwork department. I was lucky enough to get a scholarship through my wood carvings I took to the E.I.T.B interview. I learned so much about metal working in that first year at School Road from my tutors Mr Bush and Mr Budden. 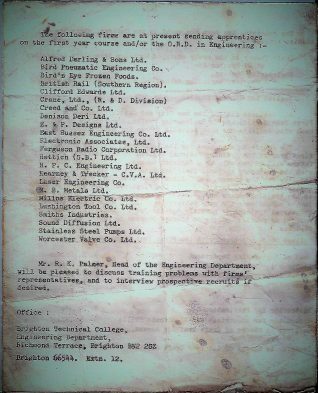 I had done quite well in the phase tests the tutors set and within 4 months Geoff Paine and Gil Percy from Kearney & Trecker turned up at School Road and offered me an apprenticeship. The E.I.T.B and School Road gave me, with no school qualifications an opportunity to work in engineering all my life; I worked at KTM and other local companies for many years and I now work as Chief Mechanical Engineer in Medical Physics at the Royal Sussex County Hospital. It is such a shame that this facility is not available to the youngsters of today, there must be many out there with the talent and dexterity but unable to find a platform to show their skills to a potential employer. I heard this week that Newhaven Technical College will close next summer. Its a shame as it only opened in September 2015, after a huge amount of money was invested in the building and equipment. 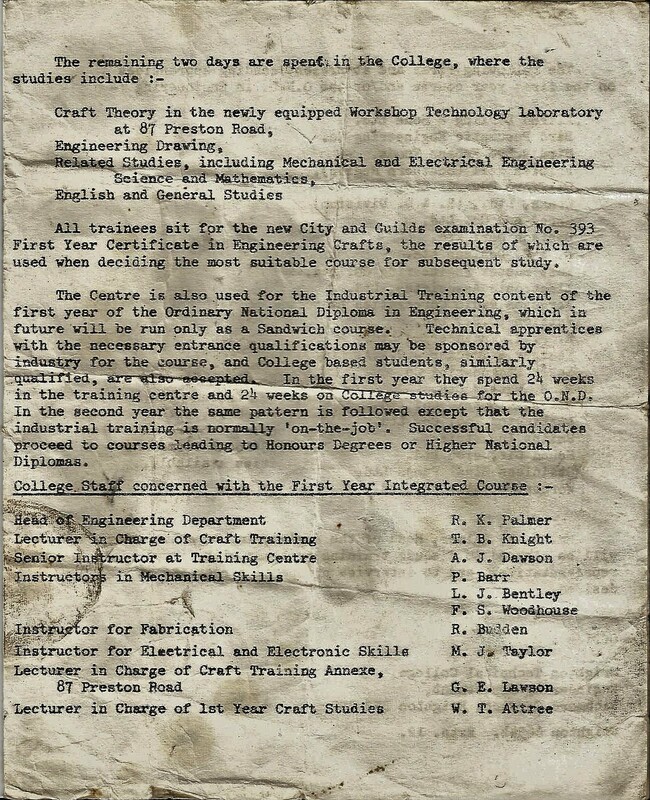 UTC, as its named University Technical College, was opened to teach students technical and scientific subjects to educate the inventors, engineers, scientists and technicians of tomorrow, what on earth has gone so wrong?